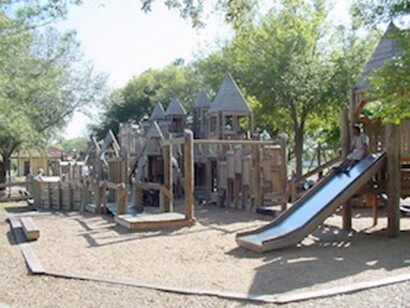 Often referred to as the “castle park,” the Community Playground is a very large wooden structure that allows imaginative play activities. Designed by nationally known playground designer Robert Leathers, this playground is quite unique and has climbing features as well as swings and a slide. A pavilion is available nearby for rental.